Microsoft Office PowerPoint is a program used to create presentations intended for public display. 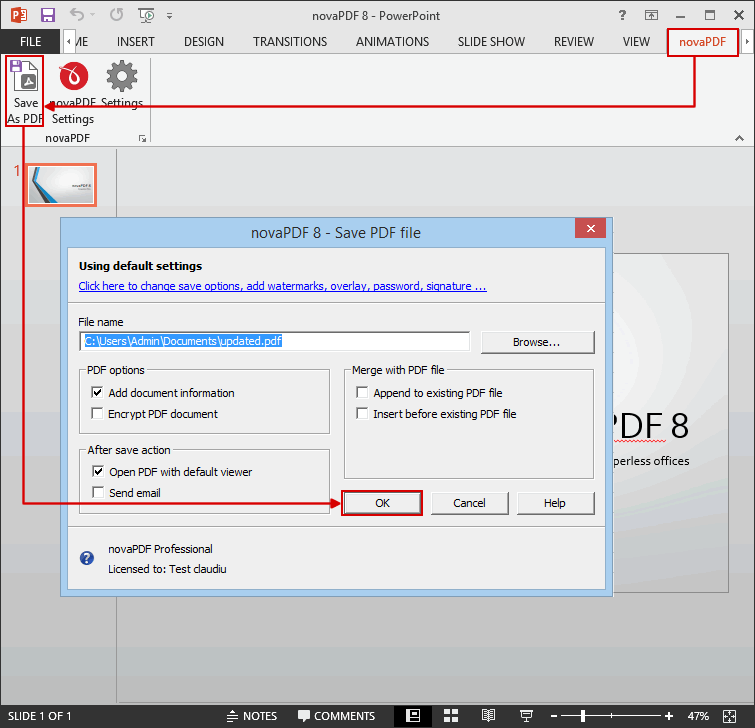 By installing novaPDF you can convert your presentations into PDF files - simply choose novaPDF as a printer and once you click the Print button your presentation will be converted to a PDF. Having your PowerPoint presentation in PDF format is an advantage if you want to send it for review (the person receiving it does not need in this case PowerPoint installed) or for printing. During installation novaPDF gives the option to install an add-in for Microsoft Office. By default the option is checked and it will add in the supported Microsoft Office applications another tab called novaPDF that will let users create PDF files directly from the Office interface by simply clicking a button. 1) Advanced - This lets you select which printer to use and if you want to save the document before converting it. 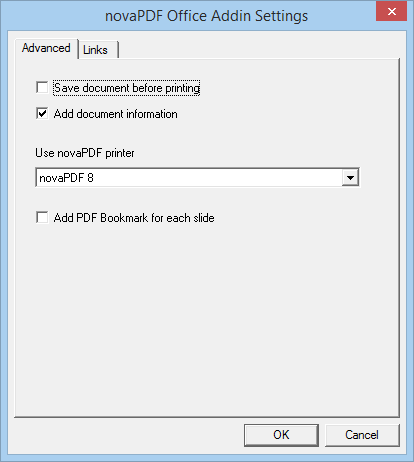 Save document before printing - When checked, it will save any changes done to the currently opened document before doing the conversion to PDF. Add document information - If you have any information added via document properties in PowerPoint, you can have that recognized and transmitted in the PDF as Document Information (i.e. the Author, Title/Subject, Keywords, ...). By default this option is checked. 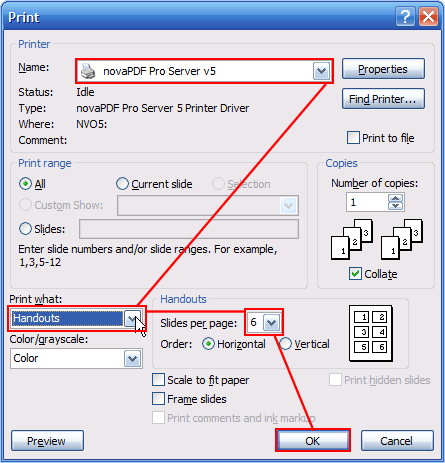 Use novaPDF printer - This will detect if you have other editions/versions of novaPDF installed and you'll be able to select which version/edition to use for the current conversion process. Add PDF bookmark for each slide - If this is checked, all the slides in the PowerPoint presentation will become bookmarks in the resulting PDF file. 2) Links - This section lets you customize how links will be detected and converted in the resulting PDF file. 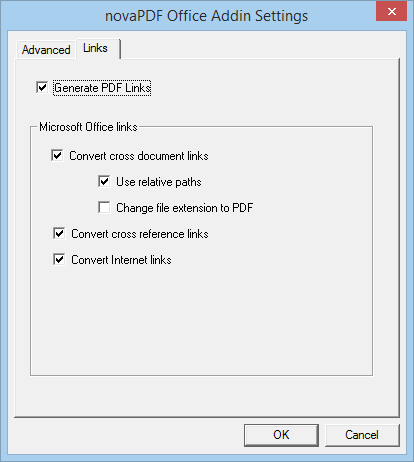 Generate PDF Links - If this is checked, all links in the current document will be detected and converted as active links in the resulting PDF file. Convert cross document links - If checked it will convert links pointing to other documents. Convert cross reference links - If checked this will convert the cross-reference links from PowerPoint (links that point the reader to various places within the same document). Convert Internet links - If checked this will convert all hyperlinks pointing to Internet addresses in the resulting PDF document. 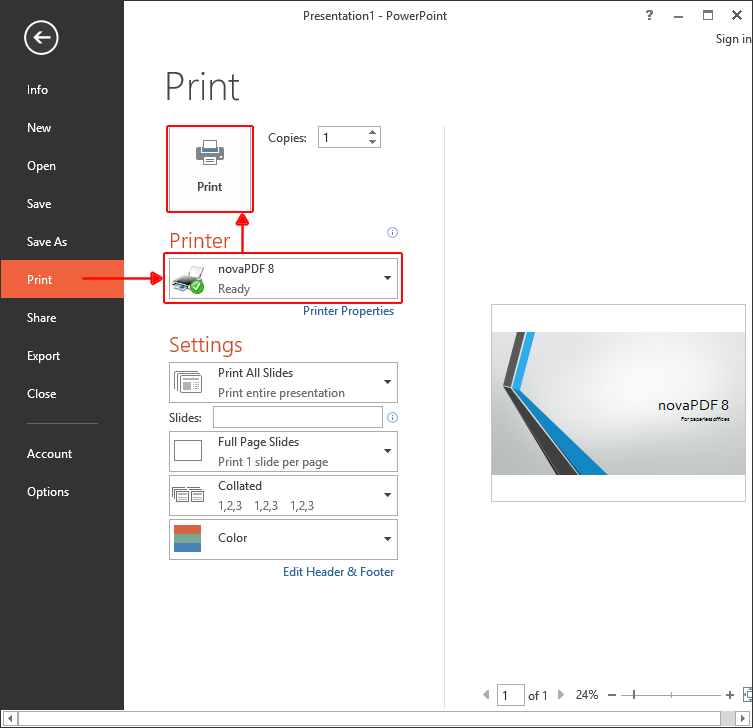 This tutorial shows how to convert PowerPoint to PDF files (ppt/pptx to pdf), if you have suggestions on how to improve this article add a comment or rate it.